We were driving on a scenic road on a hillside. The views from it over the Atitlan Lake and its surrounding volcanoes were stunning. I was expecting it would be beautiful. But words can’t do justice to how beautiful it was. There were women on the road trying to sell souvenirs to the drivers. I wouldn’t mind getting off the car and walking along the road. The views over the lake with the setting sun lighting it up were stunning. Unfortunately, there was no place to stop and walking there didn’t seem very safe. While I was admiring the lake, suddenly on our left side, a waterfall appeared. Its waters were tumbling down a hill from a few hundred meters. I was only able to say wow and could not stop staring at it. We went back there the next day on our way to Chichicastenango market. We got to Panajachel. There we hired a house with my friend and her family for two nights. For the remaining nights, we stayed in a hotel with breathtaking views of the Atitlan lake and beautiful gardens. The house we rented had a little playground with a slide, swing and a hammock. It was such great fun for our daughter especially after a few „boring” days in crowdy Antigua during Easter. Besides, the hotel where we stayed for the two last nights had a swimming pool and a jacuzzi. The smallest traveller wouldn’t mind spending there all day long. Also, there were birds in the gardens which was also excellent entertainment for her. It is a must see while in Panajachel. As we were with the kid, we only visited a small part of it. We walked on rope bridges. We saw spider monkeys. And finally, when we got to the waterfall, we took few pictures and we went back. Walking on the rope bridges with the toddler in the carrier didn’t seem a good idea. I must admit that walking on the bridges scared me so much that my daughter felt my stress and didn’t want to go with me. For this reason, my husband was carrying her. He also has some great pictures and not me. While in Guatemala we stayed at my friend’s place. We visited Atitlan Lake with her and her family. It was such a great experience to have someone to show us around. 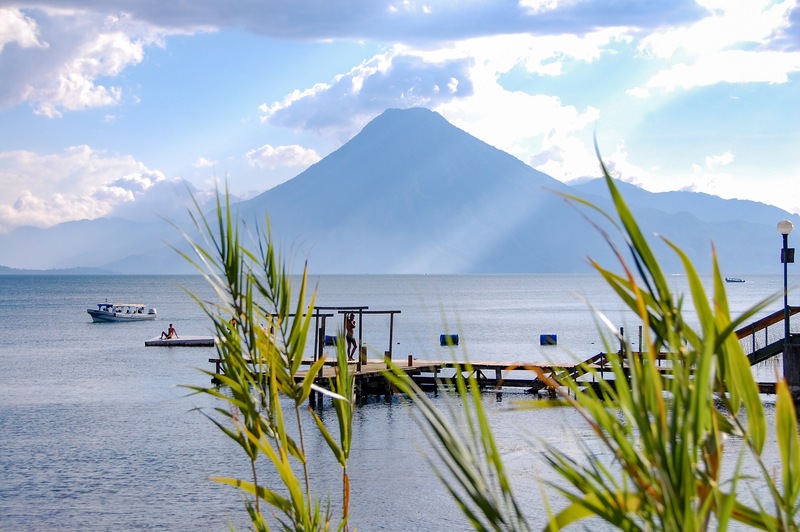 Lake Atitlan is surrounded by three volcanoes: Volcano Atitlan, Volcano San Pedro and Volcano Toliman. Volcán Atitlan erupted the last time in 1853. The other two volcanoes are inactive. The Mayan culture in the villages around the lake is still prevalent. Women wear traditional colourful Mayan dresses. There are no roads between some of the villages, and they are connected by boat. The four days stay at the Atitlan Lake was not enough at all. I wouldn’t mind staying there at least for a week or two and do all possible volcanoes treks. As a keen hiker and lover of nature, Lake Atitlan sounds like a perfect place to go for a break so far as I’m concerned. The way you describe it makes me want to go and enjoy that region now. The photos you have included certainly show a beautiful place to unwind and immerse yourself in nature. I’ve never heard of Lake Atitlan until now. Sounds like a perfect getaway with a family. Thanks for sharing your story. Wow, Lake Atitlan looks amazing! The photos are gorgeous. It looks like you had an amazing trip! Such a great, detailed and informative post! Traveling with kids can be so challenging! This looks like a beautiful place to visit. This sounds absolutely amazing! I love traveling with my kiddos! Such a gift for them and us! This looks gorgeous! I want to go! Although I’m not much of a hiker, I appreciate spending time in the nature and this place is gorgeous!! What an amazing looking experience. I love to travel but don’t get to do it much. I’m gonna put this on my travel list.